During the hot and humid summer months in Japan city dwellers would escape the heat by taking in the evening cool along rivers and waterways. 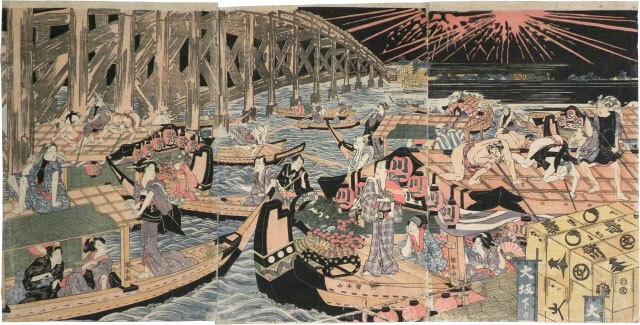 In Kyoto restaurants would offer kawayuka (riverside dining) on temporary platforms built out over the shallow Kamo River, and in Edo, pleasure boats provided an alternate venue for parties normally hosted at restaurants and teahouses. Beginning in 1731 or 1733, the government began to sponsor an annual presentation of fireworks on the Sumida River at the Ryogoku (Ohashi) Bridge. On evenings when the fireworks were on display, the bridge would fill with spectators and the river would teem with boats jockeying for position for the best view of the show, both in the sky and among the crowds. Like any public event on a grand scale, this was an opportunity to see, and to be seen. Naturally, this also became a popular subject among competing ukiyo-e artists; several artists produced prints depicting this subject (adapting similar aspects of nearly the same composition), most often in a triptych format, but both Kitagawa Utamaro (1753-1806) and Toyokuni I (1769-1825) produced double triptychs (6 panels) displaying figures above on the bridge, and below, in the boats on the water. In this depiciton three famous actors are in attendance: Ichikawa Danjuro VII (1791-1859) stands prominently in the center sheet in the largest and most well-known yakatabune (palace boat), the Kawaichi-maru, which is identified by the name, Kawaichi, marked on the red lanterns. He is accompanied by the onnagata Segawa Kikunojo V (1802-1832) who is seated, and a geisha providing musical entertainment with her shamisen. In the smaller skiff just beyond the restaurant boat is another major actor, Nakamura Utaemon III (1778-1838). The presence of these kabuki luminaries causes a bit of commotion, all eyes are turned in their direction, and even the laborers poling the boats away from each other seem to be scrambling to catch a glimpse of the stars. And in good turn, a beauty standing in the bow of her yanebune (roof boat) to the left seems to have caught the attention of Danjuro himself, the pair lock eyes, more interested in each other than the spectacular display in the sky.